Reports of iron deficiency chlorosis (IDC) of soybeans are coming in. The unifoliate leaves of soybeans are usually green, being fed by iron reserves in the seed, but as the trifoliolate leaves appear, chlorosis often develops when soybeans are grown on alkaline, poorly-drained soils. Iron is very immobile in the plant, so the deficiency appears first on the youngest leaves. Under severe conditions, the growing point is injured, recovery is limited, and yields are devastated. Farmers often ask if there are effective rescue treatments for IDC. Rescue treatments are usually effective for most nutrients, but usually not for IDC in soybeans. Traditional foliar sprays have not been effective. Two recent NDSU graduate students studied foliar sprays of iron during three growing seasons at a total of 14 locations. They tested many sources of iron, both ferrous and ferric forms, different complexes and chelates, and different adjuvants. In short, yield increases were not observed at any of the 14 sites. 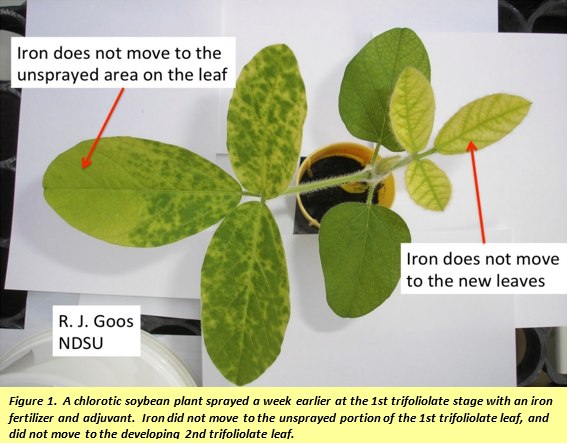 The main reason for the lack of yield response to a foliar spray of iron is the lack of mobility of iron in the soybean plant. Figure 1 shows the result of a study we did in the greenhouse. We sprayed iron fertilizers on chlorotic soybeans at the 1st trifoliolate stage, but covered the tip of the center leaf with a Post-It note during the spraying process, to prevent the spray droplets from touching the leaf. Notice, a week later, that the soybean leaves only greened up where a droplet actually landed on the leaf. None of the iron moved to the tip of the center leaflet, that was covered up during spraying, and none of the iron moved to the next set of leaves. In other words, you can green up the leaves of a young soybean plant with an iron spray, but the effect will very short-lived, as the iron does not help leaves that are forming. The only successful rescue treatment for IDC in soybeans was demonstrated by Gyles Randall of the Waseca Experiment Station in the 1970s. Back then, soybeans were grown in 30-inch rows, and everybody mechanically cultivated their soybeans. He demonstrated that 2-3 pounds per acre of a high-quality FeEDDHA product, dissolved in water, and spray-banded right on top of the rows (not sprayed over the total soil surface), could help rescue the crop, but only if applied very early, no later than the 2nd trifoliolate stage. Back then, an application could be combined with cultivation, with the farmer switching on and off the pump while cultivating the soybeans depending on whether there were symptoms. The concept worked, because FeEDDHA has both leaf and soil activity for reducing IDC. Production systems are different today, with fewer farmers growing soybeans in 30-inch rows, and even fewer doing mechanical cultivation. However, the principle is still valid, and could be adapted to today's production systems, especially for soybeans grown in 22-30 inch rows. You can download a copy of Dr. Randall's report. placement of an effective iron fertilizer with the seed at planting in the "hottest" parts of the field. To date, we have only identified three soil-applied iron fertilizers capable of reducing IDC in soybeans. These materials are FeEDDHA, FeEDDHSA, and FeHBED. However, for all three of these products, always be careful to choose the material with the highest quality, as some commercial products contain noneffective isomers and condensates. Iron fertilizers can reduce chlorosis, but can't turn a weak variety into a strong variety. Selection of a resistant variety is still the foundation of fighting IDC. NDSU evaluates dozens of soybean varieties every year for resistance to IDC. Click to view the most recent report (Table 3 in the report) These studies were supported by the North Dakota Soybean Council.